Except traveling, I guess I have driven quite a bit this week, and have been out of the office for four days - that might have contributed to my lack of updates in blogworld. On Monday I drove to Cheyenne for an early Tuesday morning meeting of the House Ag Committee in the Wyoming Capitol, where they were discussing a bill concerning the beef checkoff in Wyoming, among other topics. The meeting started at 7, and I arrived at the capitol building at 6:30 and was locked out in the dark and cold! Things got better from there, though, and I ended up with a little time, amidst my other tasks for the day, to visit Sierra Trading Post outlet and purchase a pair of Cruel Girl jeans for myself, and a really warm-looking shirt for Scott. Then, I was in the office Wednesday, and left first thing Thursday to head to the northwest corner of the state, to Powell, where Northwest College is located. That's where I'm still at this afternoon, attending the Spring Roundup, which I've found very interesting and educational. Last night I also had dinner with good friends in Cody, and tonight I'm headed to Thermop to meet up with Bob and Scott at Jerry and Robin Lake's place to visit and spend the weekend. Amidst all that, I haven't really had a chance to do much else this week except for make sure I'm on top of legislative things, make sure the apporpriate updates get put into articles as the bills move through the chambers, as well as the other normal news we always have going on that affect the state, like some bills before Congress demanding wolf delisting, and the recent deregulation of Roundup Ready alfalfa and the hoped-for deregulation of Roundup Ready sugarbeets. And, on Monday I took Baby Seehusen's gift to Cheyenne with me, and it's all finished up, so soon I will get it sent to Iowa, and then I can post photos of that project. And I did my taxes! Good news that I'm getting a refund this year, for the first time in several. It's really nice to not have to worry about paying the IRS. 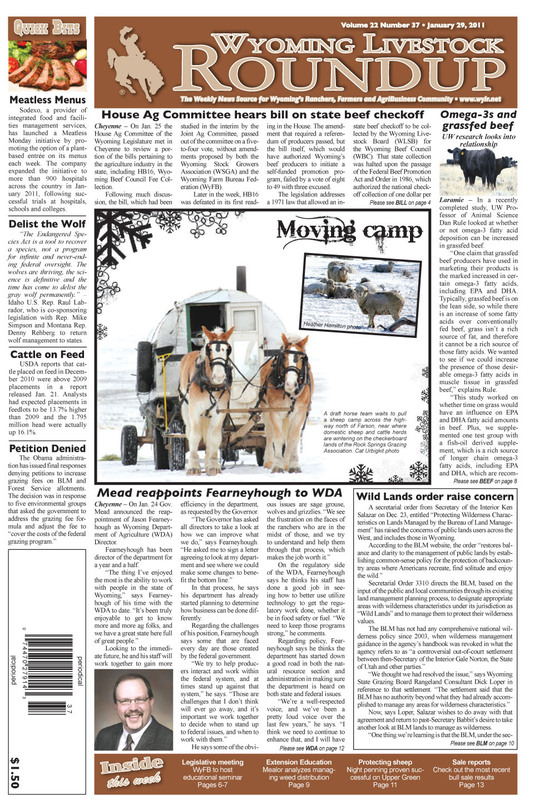 I guess one image I could share with you is the cover of this week's paper, which I thought turned out really nice. This week we featured that beef checkoff bill, a University of Wyoming study on whether or not it's possible to increase omega-3s in grassfed beef, the reappointment of the director of the Wyoming Department of Agriculture by our new Governor Matt Mead, and a review of the implications of Secretary of the Interior's "Wild Lands" executive order, and what that means for BLM lands in Wyoming. The lead photo came from a correspondent in western Wyoming. The two draft horses are pulling what's known as a sheep wagon. Sheep wagons have been used for decades by sheepherders out on the range - the guys who look after and tend to the sheep while they're out grazing. They're one of those things that, even with all the modern technologies, some things just work better and more efficiently the old-fashioned way. They're essentially a little camper, with a bed, benches, a fold-down table, drawers, shelves and a small wood stove for heat. They're used more and more rarely, as sheep operations themselves are also becoming more rare, so it's unique to see them out on the job in the parts of Wyoming that still use them. Well, after a scare that we had booked our rooms and all made our plans for the wrong weekend, it's been confirmed that our trip to Jackson in February on President's Day weekend is still a go, and that the cutter races are, indeed, that weekend and not Valentine's weekend. "We" being Scott and myself, along with Bob and Becky and friends Rick and Shannon from Meeteetse. I don't remember exactly when the plan was hatched, but we've had our rooms booked at the Antler Inn in Jackson for quite some time. I'm excited to go. My four-and-a-half years spent in Wyoming have led me to Jackson on several occasions, but always just passing through, or there on business, so I'm looking forward to going on a trip for "play." Although, I guess the managing editor is coming out in me, because I have three interviews in mind that I'll try to schedule for while we're there. Two will go in our upcoming Horse Edition, and the third will be a feature for the cover of our regular weekly. 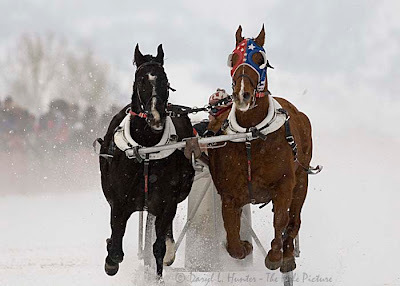 The "cutter races" are actually no longer run with cutters, but rather with lightweight chariots pulled by a pair of racehorses over a quarter-mile, and they're a big deal in some circles in Wyoming, with races held around the state all winter long. I tried to find a great photo that sister Melissa took for an article in the Roundup about the races held in Riverton, but I'm not sure I even have it in my files. I'm looking forward to taking my camera and hopefully getting some dramatic race shots to share. Also coming up in February is a potential Superbowl party, and also a snowshoeing/hot chocolate party on Feb. 13 to celebrate both my birthday and Valentine's Day. Looking forward to all three events! - Scored a tree's worth of firewood when I arrived home one afternoon to find the neighbors were taking down one of their trees. All we had to do was pick it up and stack it in our yard. - Cleaned the basement. That was a task long-postponed, after the dogs decided to de-stuff their two dog beds, which resulted in pink and green polyfill fluff all over. I finally had to clean, as it was started to encroach into the bedroom and even up the stairs to the kitchen. 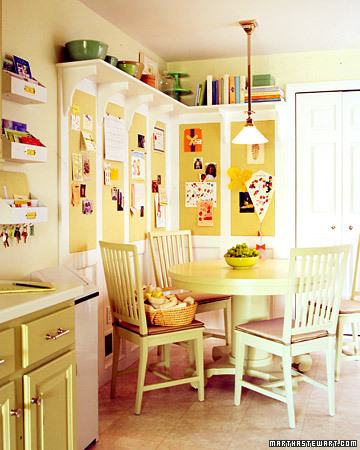 - Cleaned the refrigerator. It occurred to me that I hadn't deep-cleaned that kitchen appliance at all since I moved in - just the surface wipes now and then - and it feels much better to know the entire thing has been cleaned in hot, soapy water. It needed it, turns out, and I had lots of help from all three of the kids. - Made BLTs last night for dinner. Scott's been craving them, and they did turn out quite tasty. I'm not a fan of the Lewright's Meat bacon from our pig, though. It's sliced too thin, and really shrivels up when cooked. Williams Locker is much better, although the smoked pork chops from Lewright's are really good. - Watched Biggest Loser. It's become a Tuesday night tradition, and I think Scott's even getting involved now. In the new season that just started, Rulan Gardner from Star Valley in western Wyoming, the gold medal Olympian, is participating, so it's fun to watch him and his naturally competitive spirit. 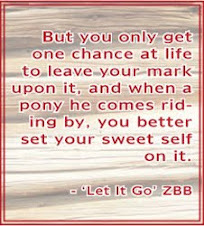 I heard him speak once at a banquet in Cheyenne, and I liked him. - Went back to Zumba class. It had been since before Christmas that I'd last been. Despite seriously sprained toe from kicking puppies on Sunday morning, I went and jumped around for an hour, and was sorry for it. After a couple days' rest I'm going to attempt it again tonight. The toe is still sore, but not like it was. - Meetings this week for work. 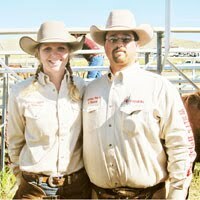 Monday was Independent Cattlemen of Wyoming (ICOW) in Douglas, Tuesday afternoon was Roundup staff meeting, and Wednesday was the Wyoming Weed Management annual meeting here in town. Next week I'll be gone a lot, with a trip to Cheyenne on Monday afternoon/Tuesday for a hearing about the state beef checkoff before the House Ag Committee, and then driving to the other corner of the state for a two-day event that Northwest College is hosting in Powell. 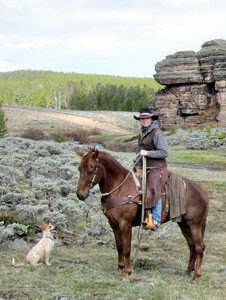 Then I'll stay up in the Big Horn Basin for the weekend, as Scott and Bob are also going up to load hay from a friend north of Thermopolis. - Right now just waiting for this week's proof of the paper to arrive so I can print it off and take a look. In addition to my previous post about how we care for our hogs in Iowa, while we were visiting for Christmas Scott and I also got out to help with other day-to-day winter farm tasks, which include giving more bedding/feed to the calves, now almost a year old. This is the group of calves from which we brought seven heifers back to Wyoming to add to our breeding herd. The first step in bedding the calves, and also getting two more bales for the cowherd to eat, is to find the cornstalk bales under the snow. In this photo my brother Nathan has the snow bucket on the loader tractor to dig out the bales. 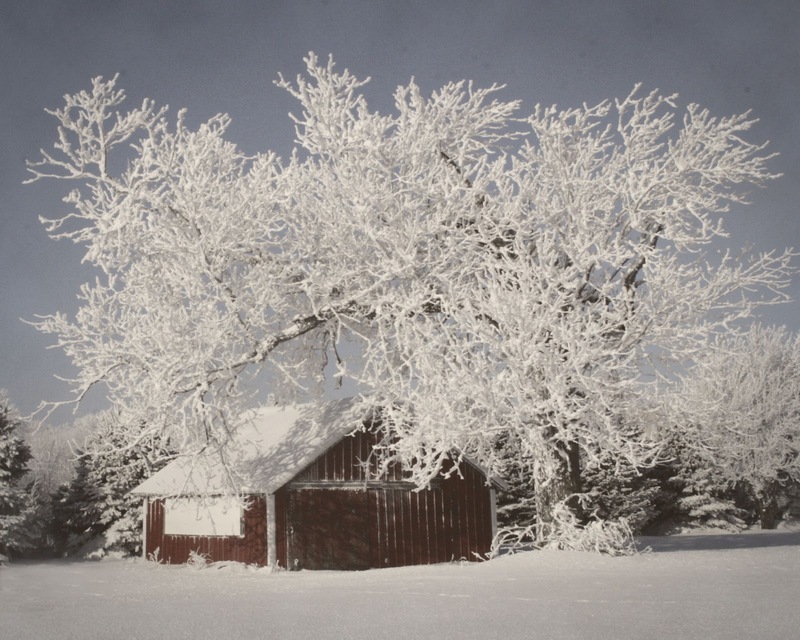 Iowa gets a lot of snow, and it stacks up everywhere. Unlike Wyoming, Iowa does not get mid-winter thaws to clear out some of the piles and mounds, which only melt in springtime, when they all melt at once and rivers flow down the driveways and ditches, the ground turns into a sponge filled to capacity and large ponds form in the fields. After digging out the bales Nathan switched to the tines attachment on the loader tractor, which spears the bale and easily carries it into the lot where the calves live through the winter. They stay locked up for the winter months so they can be fed and cared for to ensure that they grow well and stay healthy. There's really no reason to leave them out in their pasture, as the ground is covered in snow and there's no shelter from the wind and driving snow. They're really much happier where they have a shed to block the wind, cornstalks for bedding and a daily feeding of corn. Scott is also much happier when he's in a shelter and warm, with food, rather than standing out in the Iowa winter weather. The bale is set down right under the roof, on its end, and the tractor then pushes it under the overhang. This lot the calves are in is a repurposed outdoor hog lot, where my family used to keep a portion of our hogs before the new confinement buildings were built. 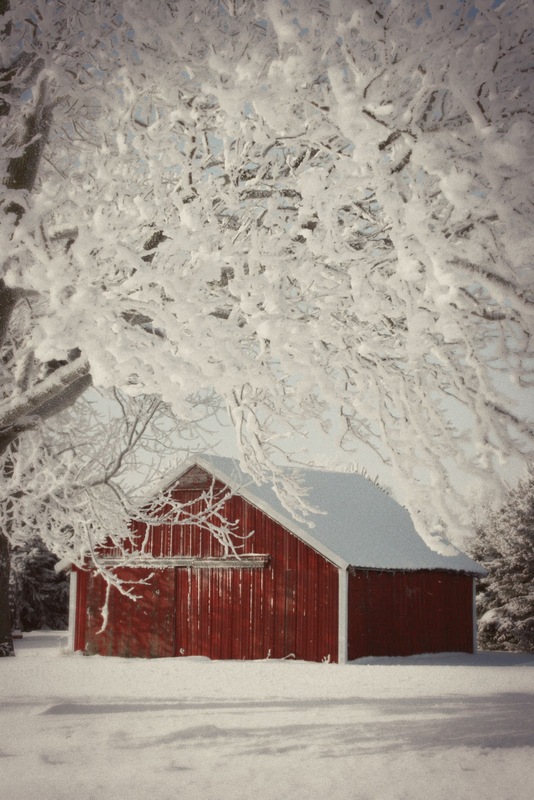 The larger, much taller part of the shed is used to house various farm equipment, grain wagons filled with corn for the calves, trucks, tractors, etc. The calves get this separate shed to themselves for their shelter. Getting the bale clear inside the shed ensures that the most cornstalks will stay where they will be best used, both as feed and as bedding, and not wasted. The bales are composed of cornstalks - a popular way to get more value from leftover corn stover in Iowa. The stalks are baled up each fall following harvest, and along with the dry forage they also contain some of the ears of corn that were missed or dropped by the combine - a special treat for whatever calf finds them first. The indigestible, more tough parts of the cornstalks become the bedding. These calves were very happy we were getting them more to eat. Talk about service! Scott cuts the twine from the bale, something that's done to keep the strings from getting frozen into the ground over the winter, which could make a big mess when it's time to clean out the pen after the spring thaw. 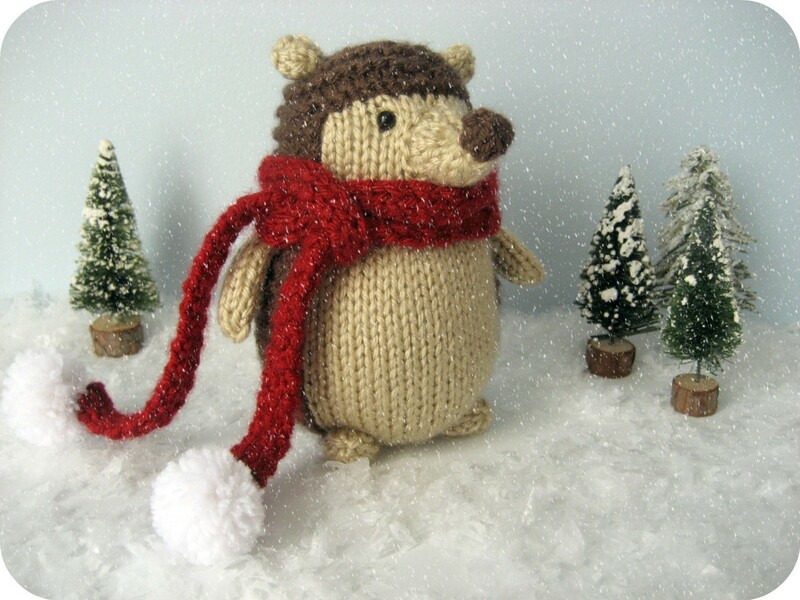 I might have to get them out after finding patterns for these winter creatures on Etsy recently. 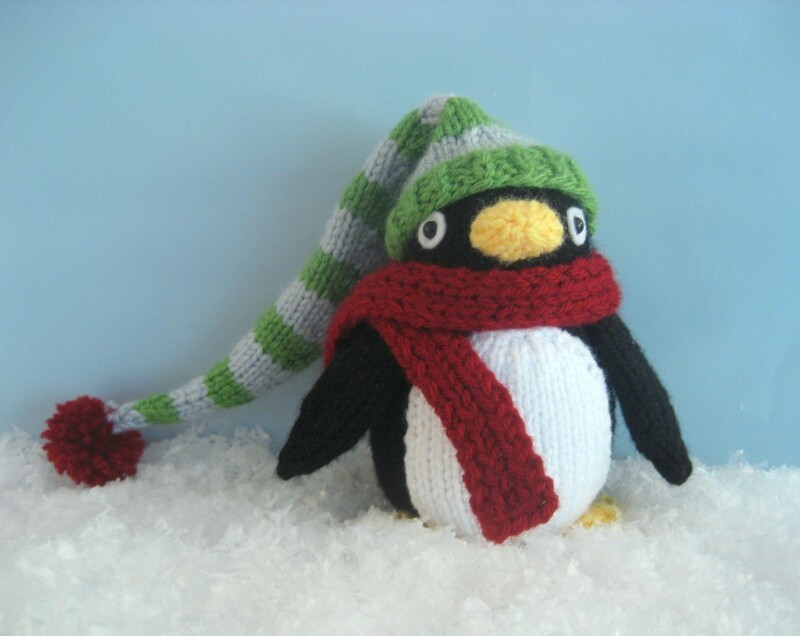 The patterns themselves are only three dollars, and the yarn to make these would only be another few dollars. The big investment would be the time, but they just might be cute enough to attempt at some point. 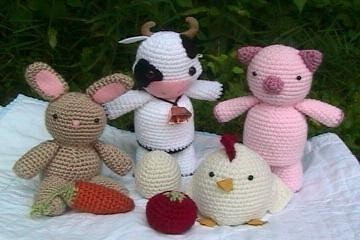 I also found these little farm animals, which is what I think my nursery theme will be. With both Scott's and my ag backgrounds, our little one needs an early introduction to farm/ranch life. I'd really like to get some things with black baby calves on them, or Hereford calves with their cute, bright-white faces, legs and tails, but having a really hard time finding something that specific. Most mainstream baby things feature dairy calves, which are cute, but somewhat out of place in Wyoming. 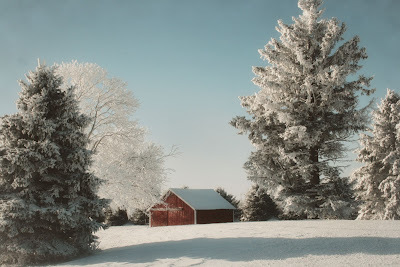 Because I haven't posted any photos from our Iowa Christmas trip except for the red chicken house, here are just a few of one of the mornings we were there. 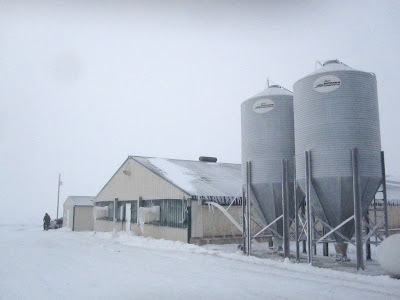 My parents raise hogs in addition to growing corn, soybeans and alfalfa on their place in north central Iowa, so one morning while we were home, my dad, sister Melissa, Scott and I went to one of the hog sites to help load in a new batch of pigs. After the barns are emptied of the previous round of market-sized hogs, they're thoroughly washed with hot water and disinfected and left to dry before the new pigs come, to prevent any diseases from being transferred from one round to the next. These pigs in the photo are 'feeder pig' size, about 40 pounds, and they will stay under my parents' care until they reach 240 pounds, or market weight, which will take about four months. 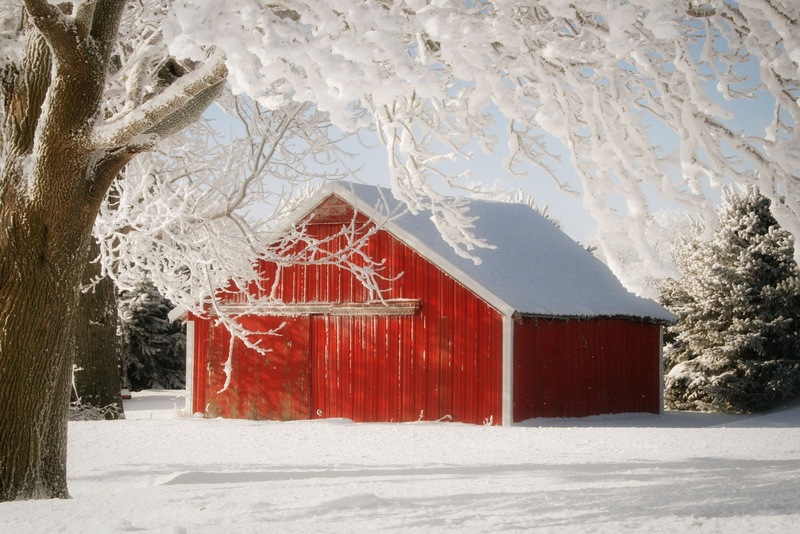 It's important to keep them in clean, well-lit, ventilated, warm and dry barns so they stay as comfortable as possible while they're growing. I'm sure these pigs are grateful to have a nice warm home in their barn through the winter months instead of surviving out in the wind, cold and snow. In the summer, when it's so hot and humid in Iowa, and there's barely a breeze for relief, the barns are also engineered to keep the pigs as cool as possible, with ventilation systems designed to keep a constant breeze, fans to ventilate the manure pits underneath and keep the air clear, and some barns even include a sprinkler system to keep the pigs nice and cool on the hottest days. In the photo above, we've opened up all the gates between the feeders and the wall to create a wide alley for the pigs to walk down before being counted into their pens. As each pen filled we'd pull the gate closed in front of the next 35 or so pigs to go in the next pen. On the right side of the photo below you can see the narrower center alley that's used for the day-to-day care of each pen of pigs. 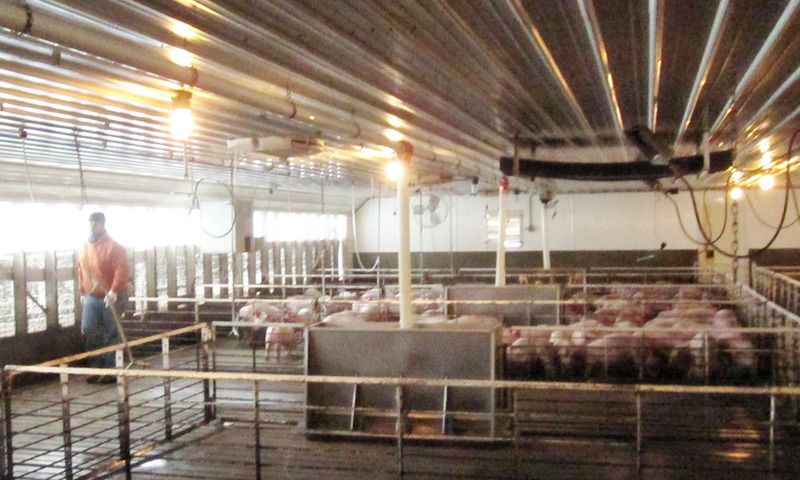 If the pigs come in as weaners, straight off their mothers, my family also lays down those black mats you see suspended from the ceiling in this photo into each pen, and the 'brooder heaters' are let down, which you can also see hiked up to the ceiling in the photo, with the black gas lines going to them. In addition to the mats and extra heat to keep the baby pigs nice and warm, they're also hand-fed a special ration every day to make sure they stay healthy and get to going as quickly as possible. No matter what kind of livestock is being raised, it's always in the best interest of the producer to take as good of care as he possibly can of his animals. That's why we also leave four empty 'sick pens' in each barn as we're filling them. As the pigs grow, some naturally fall behind, or pick up some sort of sickness, so they're pulled out of the pens of big, healthy pigs and put by themselves so they have a better chance of getting well. Without this individual attention in day-to-day management they would be jostled and picked on by the bigger pigs. It was so bitterly cold the morning we loaded in those new pigs, and I know I was sure grateful for the modern technology that means those barns were toasty warm inside, both for the new pigs and my own personal comfort! At one point during the morning I had to leave to get a different pickup, and when I got back to the site one of the trucks was backed up unloading and one little guy had escaped. After being in the warm truck, you can imagine his shock at the cold, snow and ice. He just stood there while I picked him up and put him back in the warm barn with his fellow piggies. Each barn has two feed bins with augers feeding a ground corn ration into the feeders down the length of the building. They're on an automatic sensor, so whenever the feeders start to run low the motor kicks on and fills the feeders back up. There are no hungry hogs where I come from. So there's a little bit of a crash course on part of what it takes to raise hogs traditionally in Iowa. Because bacon is so good and in such high demand, as well as barbecue pork, sausage and pork loin, raising hogs in barns like these is the best, most efficient way to supply the world with pork, and at the lowest cost, while at the same time being the best, most comfortable and protective environment for the hogs. Tonight Scott and I are having company for dinner, and the above photo is one of the recipes I'll make. 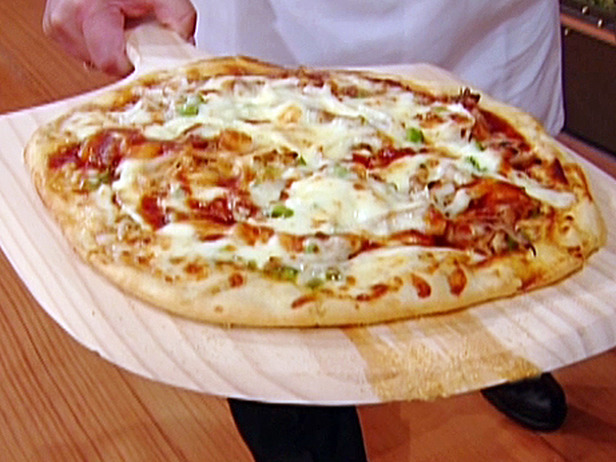 I rediscovered this Pulled Pork BBQ Pizza in the folders of my Food Network online recipe box and remembered how good it was when I made it several times several years ago. So this morning I put one of our pork roasts in the crock pot and it's getting happy today in preparation for some BBQ sauce and cheese on a pizza crust tonight. I'll also make a second pizza with something like sausage, green peppers, mushrooms and onions on it. And maybe black olives. I'm always conflicted about adding them to things, because I love them so much, but they're not exactly Scott's favorite. 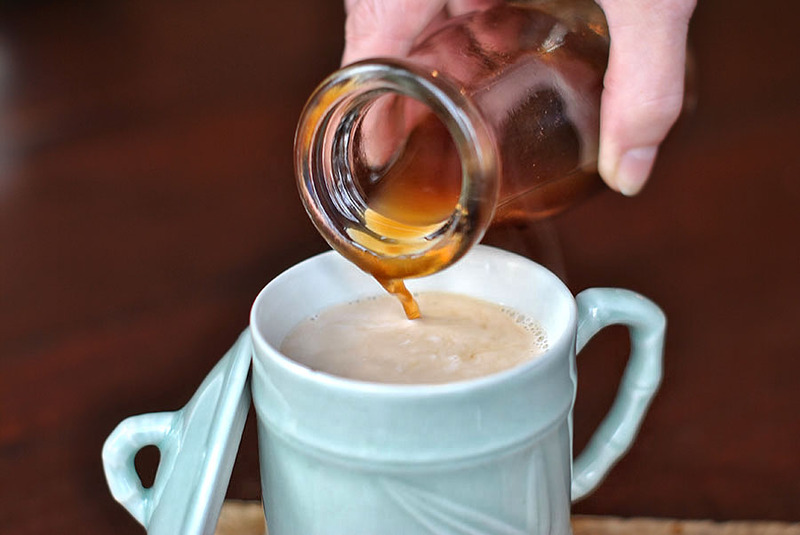 And speaking of good recipes, how does Amazing Spiced Chai Concentrate sound? I just came across this on PW's Tasty Kitchen website, and it does look very tasty. I know caffeine and pregnancy aren't the best things to mix, so maybe an adaptation of this would be a good hot drink to have in the morning, using decaf tea bags for the concentrate. It does use some spices, like star anise, that I don't normally shop for, but I'm sure they're easily found in Casper's grocery stores. The fact that we've been below zero and single digits for the last several days makes a steaming milk beverage sound even better. I got to stay home this last weekend while Scott left at 4 a.m. Saturday to take our 10 replacement heifers to the feedlot owned by a friend outside of Thermopolis. I had hesitated to commit to the trip, as earlier in the week I still had the nasty cough caught in Iowa, and my stomach had also not been feeling well. By Saturday, however, I was feeling much better on both accounts, and the kids - meaning Link, Lucy and Foxy - and I got some work done around the house. But first, Friday night started out with leaving the office an hour early - a nice treat on a Friday afternoon - and heading to the grocery store. I emptied the refrigerator before we went to Iowa for Christmas, and I had yet to stock it again. When I got home and put all the groceries away, of course the girls were on hand to help me cook supper. This is part of what I picked up for dinner. Earlier in the day I had seen Pioneer Woman's recipe for Quesadillas de Camerones, and it looked so good that I made it for supper a few hours later. In addition to the shrimp, the recipe calls for a healthy dose of red and green peppers and onions. Pretty hard to go wrong with a start like that. I cooked them in a skillet on high heat for not too long. Just enough to start to soften, but not get too soggy or mushy. On Scott's way home I had him stop and get the enchilada sauce for the shrimp, which I somehow left off my grocery list. Yum! Butter, tortilla, cheese, veggies and shrimp get topped by a little more cheese and another tortilla. I always use whole-wheat tortillas for my creations. Looks promising! Even though I did have some trouble getting the whole thing flipped. A bunch of the stuffing came out, but that just provided a prime opportunity to sample. The second one I made I didn't fill as full, and had more success. Add a little bit of low-fat sour cream, and we were in business. Scott also really liked them, so I think they will become a quick-and-easy staple for supper. These shrimp weren't frozen, but I might try to find a frozen bag so I can keep the ingredients on hand for last-minute preparation. I just about always have the peppers in my refrigerator for one use or another. The next morning, after Scott left at 4 a.m., I went back to sleep for a few hours, then got up and started taking down the Christmas tree and outdoor Christmas decorations since it was warm out, and forecasted to snow Sunday. Link helped, of course, until I unceremoniously bumped him off the porch rail into the rose bush with the shovel handle. He was not very impressed with me as he hid under the car and watched me finish up. Of course the girls also had to be a part. When I'm working in the front yard they usually tear around in circles of all manner, to the extent that there's a puppy racetrack path around one of the trees now. They're very good about staying in the borders of the yard, so usually I don't have to worry about their wild fighting and chasing. It's a good way to wear them down a little. The bare front porch. No flower pots, no autumn decorations and no Christmas lights and evergreen boughs. Every so often Scott brings home a load of 2x4s from his work that we cut into lengths to fit in our wood stove and stack on the front porch. The lumber comes to their yard with loads of steel, and it's only about four feet long, so not much good for anything else. It's free, and easy to get, and we burn these little sticks in the evenings when we can keep the stove supplied, saving our larger chunks for during the day and overnight. The little pile of evergreen is part of what came off the railings, and it's the pieces that are small enough to fit in the stove. Again, there's a couple evening's supply of burning right there. I'm all for not running the furnace! This tree that we chose from one of the mountain pastures at the Association was my first real Christmas tree since being out on my own, Scott's and my first tree together, and the first one in the new house. And now there it is, unceremoniously resting in my truck. I hear there's a tree drop-off location by the Extension office here in town, and that's its final destination. I thought it was very pretty, and enjoyed it very much. So now there's quite a vast space that's opened up again in the front room. My eight-dollar Salvation Army desk will eventually come in to occupy the space as the landing spot for mail, bills, etc. I'd like to paint it first, but I suppose I could always haul it back outside come warmer weather, if even just to the front porch. More cooking of favorite recipes on Saturday. These are the Marinated Tomatoes, which I find addictive with their oil and red wine vinegar marinade. Add a little bit of grated mozzarella, and it doesn't get much better. I ate the equivalent of probably four tomatoes that afternoon. My stomach only felt really upset for about a week from the pregnancy, and now I'm pretty much back to normal, save for the fact that I still don't want any really heavy meals to eat, and nothing at all sweet. I find that the things I want to eat are all the things I should be eating, so we're in good shape. On my grocery trip I had also picked up salad ingredients, including this endive. And I have two big containers of delicious salad, which I top with mushrooms, olives, croutons, onions and whatever else I have in the cupboard/refrigerator and top with oil and vinegar with some salt and pepper. Delish. Sunday afternoon the girls were driving each other and myself up the wall, so I bundled up against the cold and five inches of fresh powder, and off we went to the golf course for exercise for all three of us. They love playing in the snow. Much time is spent running and growling and fighting in crazy circles when we go to the golf course. I'm glad there's a place so near the house where they can run off-leash. Usually we play fetch, and I brought Foxy's new ball in hopes that there would be some areas blown clear on the greens, but no luck. I threw it once and they promptly lost it in the powder, so that was the end of that. Trudging through the snow for a mile round-trip was great for all of us, and the pups slept peacefully most of the evening after their romp. Scott arrived home as I was shoveling the sidewalk and driveway after our walk, and after going inside I finished making this Roasted Tomato Basil Soup and we had it with beef roast and vegetables for dinner. As with all good weekends, it ended too quickly, and here I am back at it, working on the Jan. 15 edition of the Roundup. And it was -24 degrees this morning! I didn't even try to start my little diesel car, and my truck didn't really want to go, either. 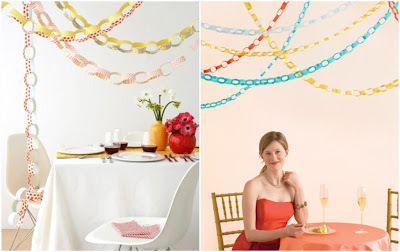 A recent post on Celebrations at Home featured paper chains, and how more and more people are starting to use them for year-round parties these days. I think they're quite pretty, and maybe I should add them to my plan for the tent at our Wyoming wedding reception the end of May. That would be quite pretty and spring-like. After that long but delightful Christmas absence from just about all things cell phone/laptop/internet, I am now back in Casper and back to work, expecting the proof of this week's paper any minute now. Scott, sister Melissa and myself had a great and fairly uneventful trip to Iowa, which is a good thing, considering some of the terrible, stressful drives to and fro that have happened in the past. We arrived Dec. 23, so were able to celebrate Christmas Eve, Christmas and New Years Eve with both immediate and extended family. One of the days mid-week the whole family traveled south to Ames, where Iowa State is and where I went to college. There we met up with one of my uncle's families for dinner and we attended a women's basketball game in Hilton Coliseum, and it was nice to be back and revisit campus, which I try to do on every trip home. Scott and I also spent time with my dad the Tuesday that we were home to take all the calves to the vet, and brand all the heifers, seven of them, which came back to Wyoming with us as a half purchase/half wedding gift deal. We also helped load in feeder pigs into one of the hog sites that my parents own and operate - Scott is slowly getting his initiation into what raising hogs is like. I helped my mom cook for our extended family's New Years Eve party at my parents house, and then I helped cook for our wedding reception held New Years Day, also at my parents' farmstead. We ended up with just about 90 people coming to see us for our wedding party, and it was great to see people with whom I hadn't crossed paths in years, and I did my best to spend a few minutes visiting with everyone who came, although I know there are a few families that I missed. Scott didn't vapor-lock on me, and he held his own visiting with the many people who were curious to talk with him a little bit. For not being a crowd person, and not thriving on visiting with lots of new people, he survived quite well. But he was very glad to head home to Wyoming dark and early the next morning - 3 a.m. So this week has been spent recuperating from all that. Thankfully the paper was easy to put together, as Heather and I had lots of overset left in our files from the holiday break papers. And....... this week has also been spent recuperating from finding out that Scott and I are expecting a Mini Martinez! I'm nervous about handling a first newborn along with my demanding full-time job, but I think with proper preparation and ample planning we will be ok, both our family of three and the Roundup staff. If I didn't have to work full-time, and if the paper didn't take so much of my attention and energy, I would feel almost no pressure at all. I guess there's no time like the present! Scott and I have wanted to get started with a family sooner than later, and if all goes well and I can handle it, we'll have most of our baby births done around the time that he turns 40. So anyway, that's just a little bit of what's been going on around Iowa and Wyoming since my last post two weeks ago. 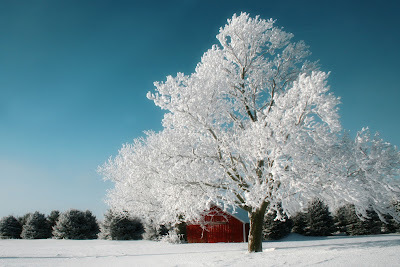 The photo at the top of the post I took on an especially frosty day in Iowa. It had been cloudy and foggy for a couple days, and when we were out and about taking care of some farm work the sun came out and thankfully I'd had the chance to grab my big camera to take some pictures. The red building is the last original building standing on what we know as the Ruby Farm, where my great-granddad Ruby farmed and where my Grandma Hemken grew up. My grandma has really advocated for saving the structure, and last summer it was the proud recipient of new tin siding, and it sure is pretty in all the snow and frost. My grandma has also advocated for saving this really old, big tree over the chicken house.